Today I went to the Dudley Bluff, or is it the headland? I am not sure. It was a fine sunny day so I took a trek along the bluff into the heath country. Oh yeah, I took my flash and flash mount and monopod. What a mistake! I think I would prefer to go into the bush with just the camera and having it hand held. It is heaps better and lighter and more manouverable through the bushes. Anyway, back to the birds. 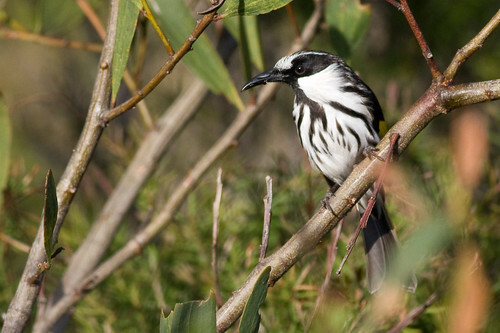 A pair of White-cheeked Honeyeaters(Phylidonyris nigra) were perching on a bush near the track. They stayed there for a fair while but I just could not get over some of the bushes in the way. The out of focus foreground bushes in this one are a bit of a distraction, but oh well. 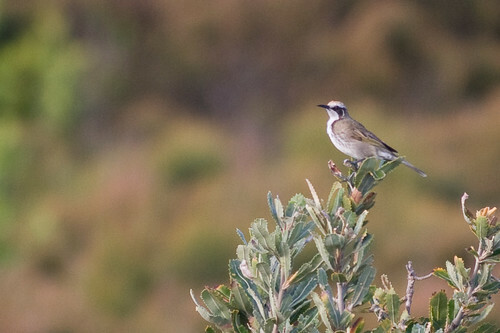 Then I saw a Tawny-crowned Honeyeater(Phylidonyris melanops) on the top of a bush. It was a fair way away and I could not get any closer. The background in this photo is just beautiful. I love the pastel shades. 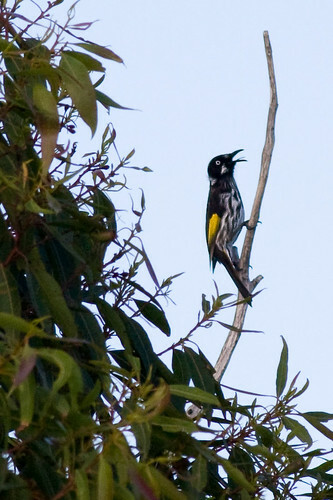 On the way back, I saw a New Holland Honeyeater(Phylidonyris novaehollandiae) on a stick. I was lucky to get a shot of him as he was singing a lovely song just for me. ha ha. Here is another shot with a different framing. I like the framing of the bushes and the stick. It is cool. The other birds that I saw were a Crimson Rosella, Red Wattlebird, Eastern Spinebill, and a White-bellied Sea-eagle magnificently flew by and I stuffed up the shot. doh! Bird Photography at Ash Island , 27th March, 2009. I went out at 3pm to Ash Island for a couple of hours of bird photography. It was pretty overcast and for a little while it rained a bit. Today was raptor day at Ash Island. I must have seen about half a dozen different raptors. They were everywhere. Mostly they were low on the ground and flew off before I could get any shots off. Anyhow, this first photo tells a story. There was what looked like a Whistling Kite on the road chewing on something. It flew off a little way with the kill and then came back again. I stopped to watch it but it flew off before I could get any photos of it. I walked up to the kill and had a look at it. 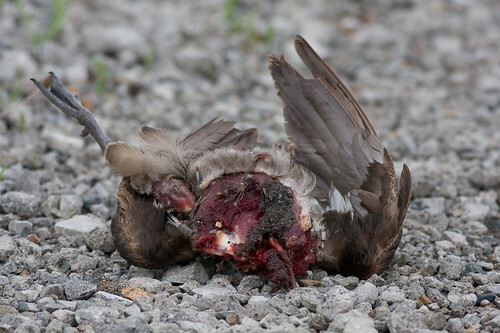 I think it was the carcase of a chestnut teal. It is a bit gruesome, but that is reality. Raptors are predators that kill birds to eat. End of story. I took a circuit around the pond, and over the other side there were various raptors flying up but this Australian Hobby was the only thing that came close enough for a photo. He perched on the power lines and checked me out. I quite like the lines on this photo. It is something a bit different. On the way out I surprised a Swamp Harrier who flew low over the swamp and off to the north east. This morning I went to Ash Island. 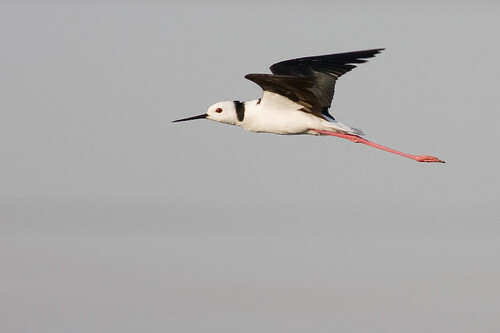 As I got to Wagtail Way there were the usual Black-winged Stilts and not much else. I waited for a while, hoping to maybe see a raptor or two. 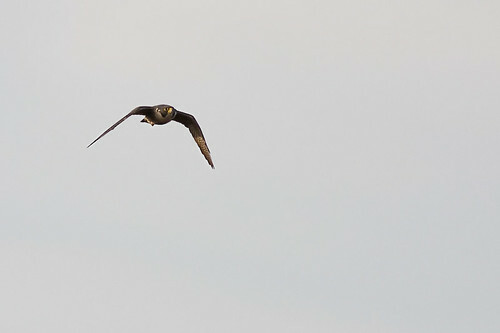 All of a sudden this Peregrine Falcon(Falco peregrinus) flew towards me. 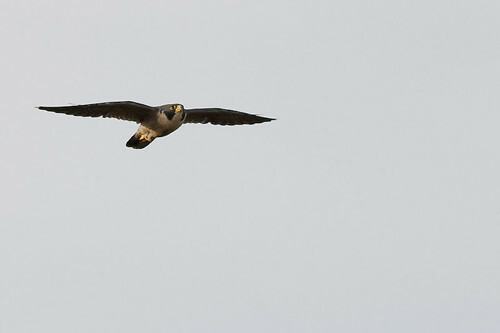 The Peregrine Falcon is a member of the Ciconiiformes Bird Group and family Falconidae. They are reputed to be very fast flyers and are exceptional hunters. 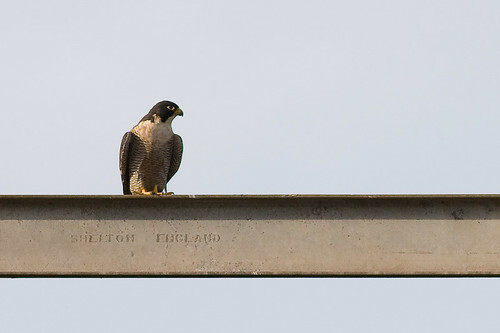 The Peregrine Falcon sat on the power pole ahead of me and had a good stare at me and looked around for a while. 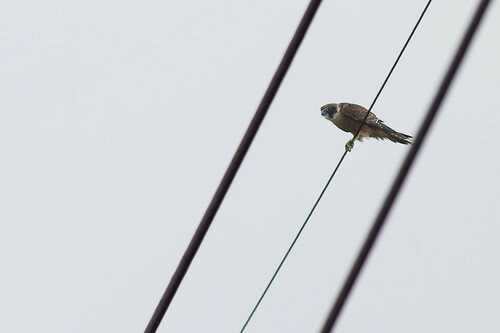 Then he flew off to the west, looking for prey and alighting onto another telegraph pole near the river. I took a drive around the pond, seeing not much besides some Pelicans and some Chestnut Teals. I headed home and just screeched to a stop because I saw a Sacred Kingfisher(Todiramphus sanctus) on a dead branch with what looked like a little crab. yum yum. Today I went to the Stockton side of the Hunter River to look for the Pacific Golden Plovers that hang around the wreck. But they were not around. There wasnt much of anything around. I took a few photos of some Welcome Swallows and Magpie-larks but nothing turned out very well. I then went over to the Stockton Sandspit under the bridge and walked towards the sandspit. There were a few Eastern Curlews with a flock of Silver Gulls and some Pelicans. 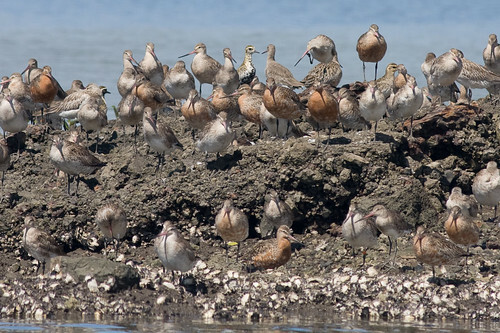 There was a flock of Bar-tailed Godwits feeding in the shallow water. I do not think there were any Black-tailed Godwits with them as far as I could tell. 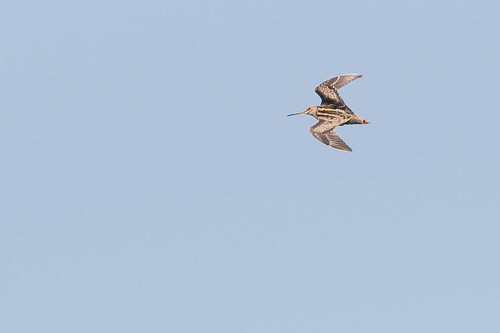 The easiest way to tell Bar-tailed from Black-tailed Godwits is to see them in the air. 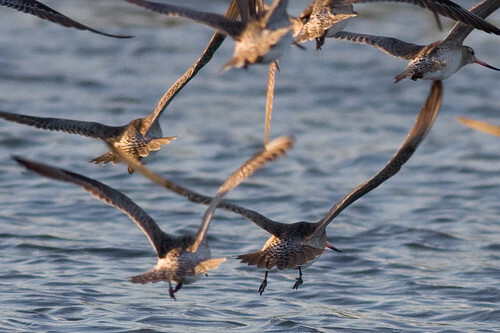 Notice the tail feathers on these Bar-tailed Godwits. The Black-tailed Godwits have a solid black bar at the end of the tail with white on the rump. They also have a white stripe on the wing. 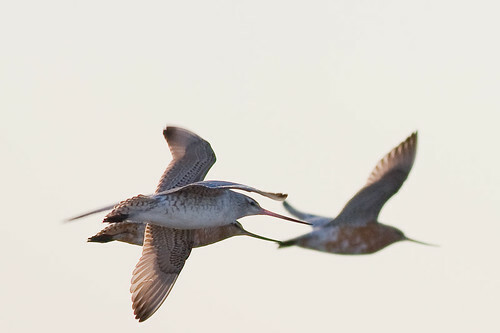 Here is another shot of some Bar-tailed Godwits in flight. 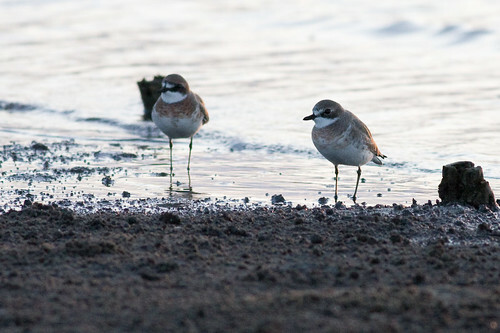 After the Bar-tailed Godwits had flown off I noticed some smaller plovers on the beach. There were a couple of Lesser Sand Plovers(Charadrius mongolus) who were fossicking on the beach with some Red-capped Plovers. 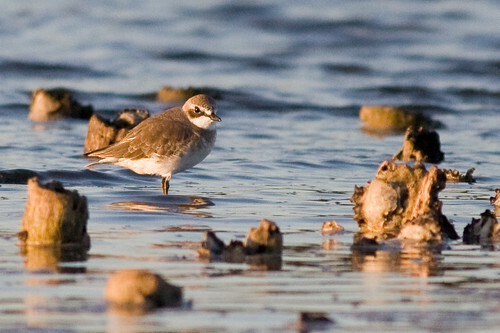 The Lesser Sand Plover was formerly known as the Mongolian Plover. This day I went on an outing to Jerusalem Creek with the HBOC. Jerusalem Creek is just out of Dungog, towards Chichester Dam up in the Barrington Tops National Park. 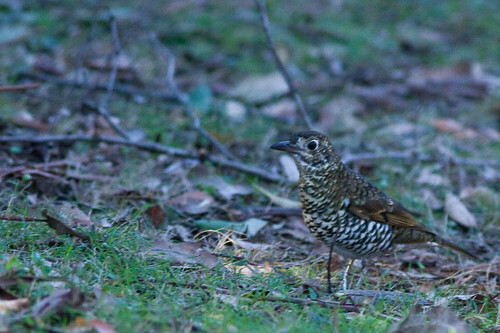 When we got there, we saw a Bassian Thrush(Zoothera lunulata) just hopping around in the car park. We set off following the track through the rainforest, past the waterfall to the right. At the lookout near the waterfall we saw a grand total of two birds, a couple of grey fantails. Setting off back along the track, we saw plenty of places where the lyrebirds had been scratching in the dirt. 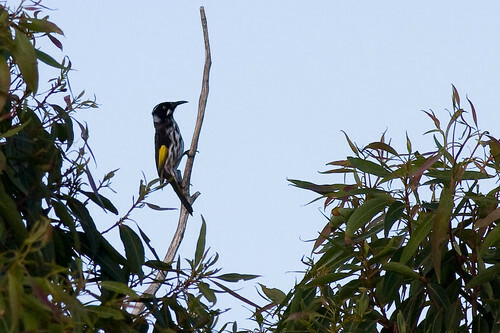 We heard some Glossy Black Cockatoos and saw a couple of scrub-wren but nothing much. It was as dead as a door nail. Down on a bridge in the valley we spotted what we thought was a whipbird but the photos were a blur. I just could not get a decent shot of him because of the darkness and the leaves in the way. 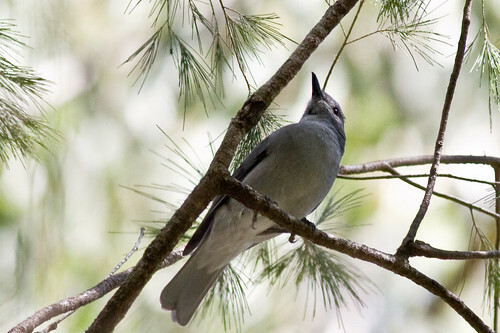 Later on, coming up the hill, we managed to spot a grey Shrike-thrush(Colluricincla harmonica) up in the trees on a casuarina. 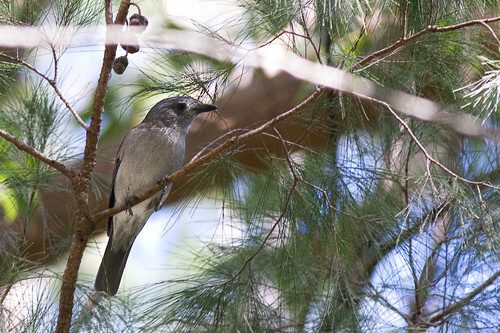 And here is another photograph of the Grey shrike-thrush. There was not much else that I saw. All in all it was a pretty dead day, not many birds around. But i did manage to photograph two new birds for that day and I had a wonderfull walk through the rainforest, so it was a good day after all. Today was a bit of a dud when i went to Ash Island. There was a White-bellied Sea-eagle sitting on a power pole and he flew off but I did not get a decent shot of him, and he was flying away from me, anyway. The only thing around were the Black-winged Stilts and the obligatory Swallows and a flock of what I thought were Sharp-tailed Sandpipers, but they were too far away on the other side of the pond to get any good photos. So, I just practiced my Birds in Flight(BIF) photography. Here is what I do. I use the back focus button and I have the AutoFocus(AF) set on AI-Servo. It is best to have the bird coming along ways rather than straight at you. And try and get the light so that the bird’s face is lit and not in shade. Try to photograph the birds in flight from the front, rather than going away from you. Normally I use Manual Exposure. For dark birds, I overexpose about 2 stops and for white birds, i will overexpose about 1.3 stops. I try to have at least a shutter speed of 1/1000 or more, maybe 1/1250. I do not think it is necessary to go faster than this. If I have enough light I will try and get the best ISO i can , and try and get an aperture something like f/8. But mostly I use f/5.6, because I like to keep a lower ISO. 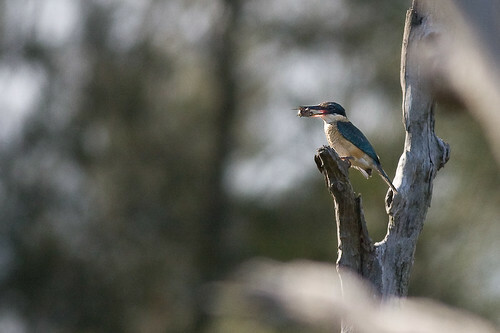 If you have a top end camera you can bump up the ISO and the inbuilt noise-reduction will sort out the jaggies for you. The photo above was shot at 1/1000, f/5.6 and ISO250. What else is there? Oh yeah, I only use the center focus point, and not the nine points. That is my opinion, I think the center focus point only is faster and does not go tracking off onto other crap in the viewfinder. But try it for yourself. But herein learn the secret of Birds in Flight Photography. Dont worry too much about all the technical details. Get the basics down. That is your exposure, and make sure you have a fast enough shutter speed, ie , greater than 1/1000. The big secret is practice, practice, practice. Just keep doing it and doing it until you get competent at it. Bird Photography at Soldiers Point, 18th March, 2009. This morning I went to Soldiers Point on the Central Coast. It was a great day with four new birds – Red-necked Stint, Grey-tailed Tattler, Ruddy Turnstone, and Double-banded Plover. So without more ado, I present the Red-necked Stint(Calidris ruficollis). This one has just started to get the colour of the breeding plumage. 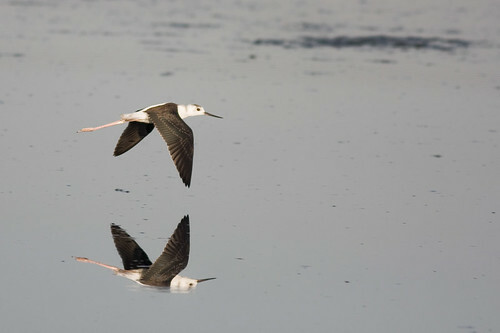 The breeding plumage of the Red-necked Stint involves deep salmon-pink on the head and nape, diffusing into pink on the mantle and wing coverts. 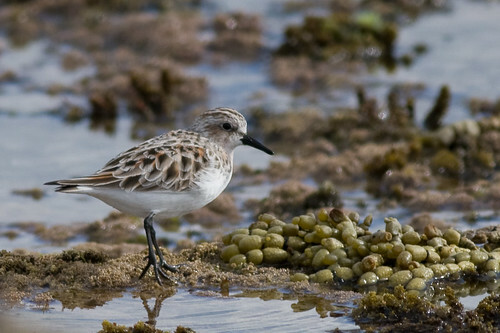 The Red-necked Stint breeds in Siberia and Western Alaska and arrives in Australia around August or September and leave about April. 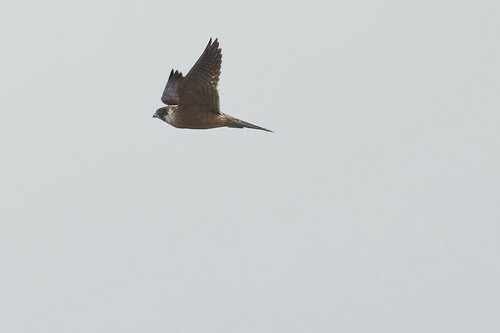 Here are a few in flight, showing the distinctive patterns of the wings and the black bar vertical on the tail. The next new bird was the Grey-tailed Tattler(Heteroscelus brevipes). The Tattler is also a seasonal migratory wader travelling between Siberia and Australia each year. This bird was observed feeding on crabs. 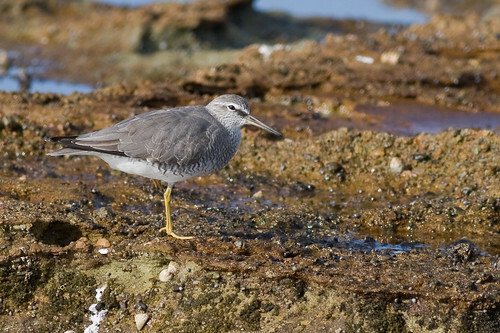 The Grey-tailed Tattler is quite similar to the Wandering Tattler. To tell them apart, observe the eyebrow. The Wandering Tattler has an eyebrow which is very thin just behind the eye. The nasal groove of the Wandering Tattler is a lot longer than that of the Grey-tailed Tattler. 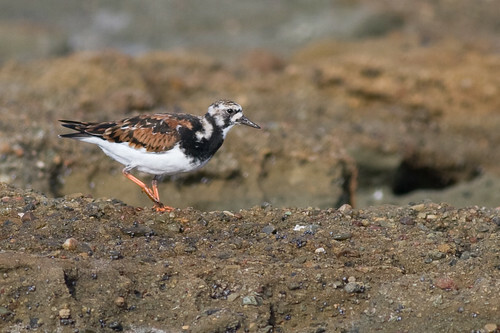 And then there is the Ruddy Turnstone(Arenaria interpres). 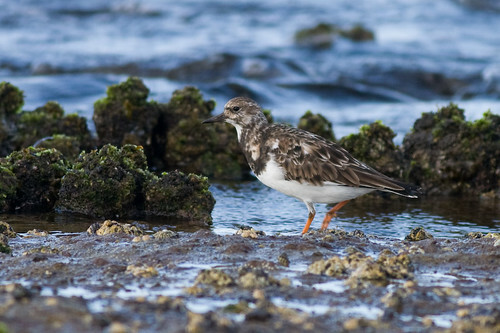 The Ruddy Turnstone forages among the algae, cunjevoi, and under stones in search of small invertebrates. This one has not got the breeding plumage yet. And this Ruddy Turnstone has started to get the breeding plumage. 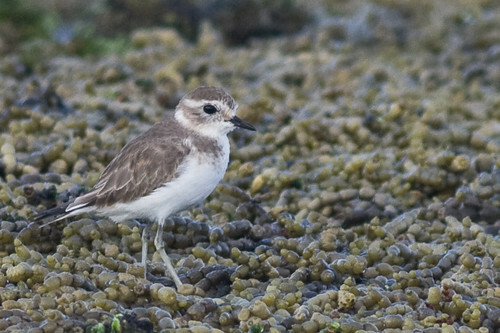 And the last new bird was the Double-banded Plover(Charadrius bicinctus). 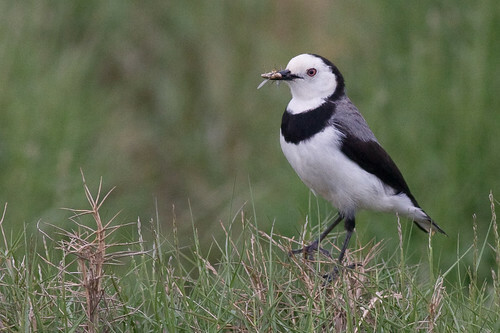 The Double-banded Plover migrates to New Zealand where it breeds and then flies back to Australia in the winter. This one is an immature bird, lacking a chest band. 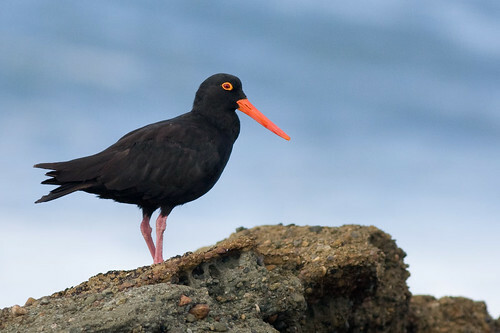 And I just had to include this photo of the Sooty Oystercatcher(Haematopus fulginosis) against the beach. Bird Photography at Tomago Wetlands, 17th March, 2009. Today I went with the HBOC survey group to Tomago Wetlands. This is the second time I have been to Tomago Wetlands. The first time it was very dry. The weather was clear with sunny skies and a temperature of about 24 degrees Celsius. But, the big news is that I have seen four, count them 4, new bird species, with photos. The other big news is that it was officially raptor day at Tomago, with no less than than ten raptors seen during the morning. 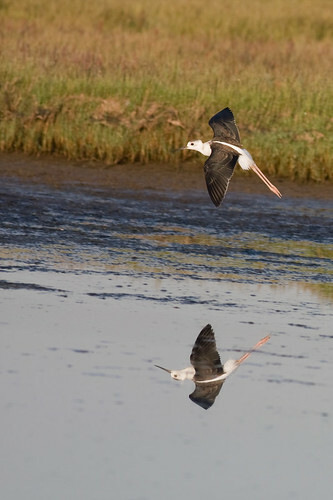 Australian Hobby, Black-shouldered Kites, Swamp Harrier, and Whistling Kites. As soon as I pulled up in the car, there was an Australian Hobby right where we met up. So off we went into the wetlands and stop near the gates where we saw a heap of birds in the Casuarina trees. And the first new bird was a Shining bronze-cuckoo(Chrysococcyx lucidus). It may be also called a Golden Bronze-Cuckoo, but I am not sure about that. 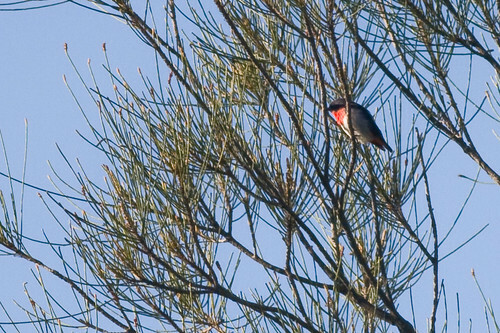 Up towards the river was a Male Mistletoebird(Dicaeum hirundinaceum). I think there may have been a female one, but I am unsure about that. First time seen for me. 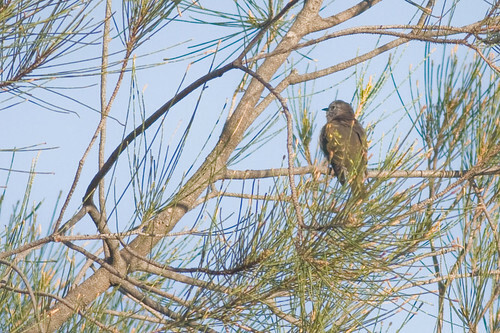 The next new bird was Dicrurus bracteatus, the spangled drongo. 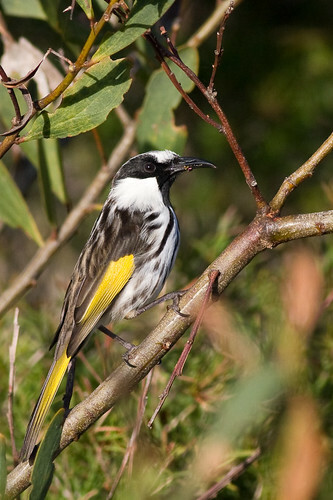 This bird is very easy to spot with its distinctive bifurcated tail. Along the flats there were a lot of grassbirds, Golden-headed Cisticolas and some Southern Emu-wren. We managed to disturb a Latham’s Snipe(Gallinago hardwickii) which took off into the air and flew quite a ways, more than they usually do. 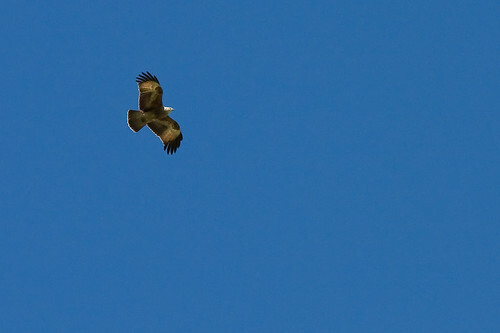 Going back to the parking spot, we spotted a couple of Whistling Kites(Haliastur sphenurus) and here is one of them. So all in all it was a great day for me with four new birds – Shining Bronze-cuckoo, Spangled Drongo, Mistletoebird, and Latham’s Snipe. Bird Photography at Ash Island and Stockton , 16th March, 2009. I went to Ash Island early in the morning and saw a Black-shouldered Kite along the road. He hovered and then dove into a field and flew off. I could not see if he caught any prey. Then down to the pools along Wagtail Way. There were heaps of the usual swallows so I practiced my Bird in Flight photography on them. Nothing came out all that good. The light was pretty low. I went around past the Railway line and then back towards Ramsar Road. 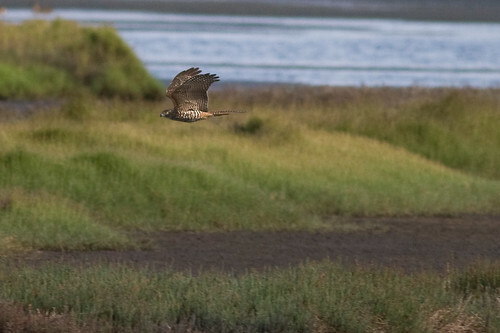 I spotted a Nankeen Kestrel on the way but it was too far away to get a decent shot. Then I headed around to a track off Ramsar Road to have a look at the White-fronted Chats who were once again posing with the bug in the bill. They are such posers, these birds. This one is a male. Notice the dark black band in front with the sharp edges. 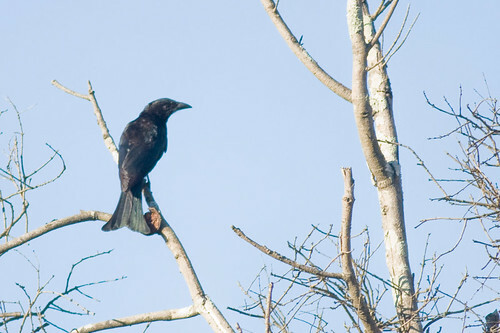 The male has also a dark black band over the head with distinct edges. 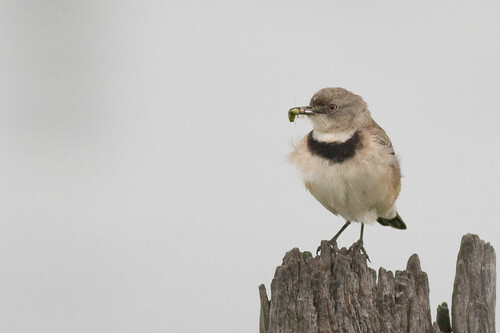 The female White-fronted Chat has a greyish head without the distinctive black bar and the black front bar has not as sharp edges. Also the wing primaries are greyish, whereas they are dark black on the male. I left Ash Island and then drove to the Stockton side of the Hunter River, just past the wreck. 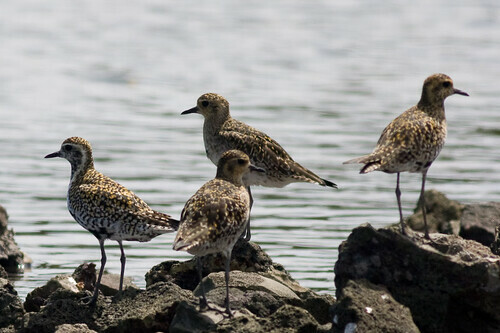 There were about 8 Pacific Golden Plover. This group is distinctive from the group that hang out at the Kooragang Dykes. I took this photo to show the wing feathers. This one still has not got the breeding plumage yet. 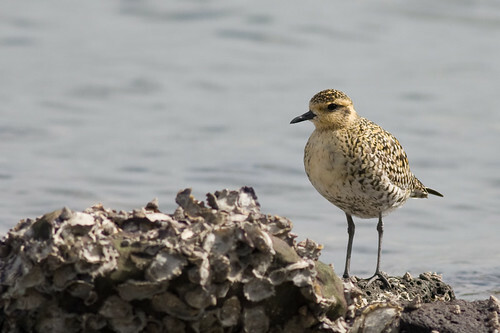 This Pacific Golden Plover is just starting to get some breeding plumage. Notice the black speckles down the front which will turn fully black with a white line from behind the ear down the sides of the chest. Note: Click on a photo, to get a larger version. Today I had a boat ride to the end of the kooragang Dykes thanks to Liz and Chris from the HBOC. When we got there the Bar-tailed Godwits and Black-tailed Godwits were roosting. 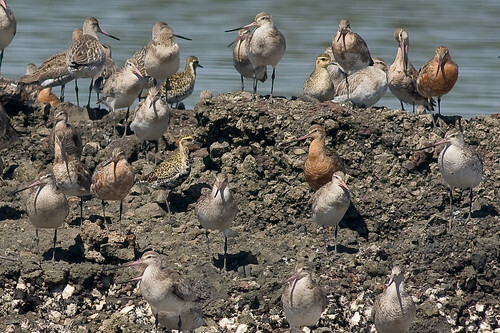 The Bar-tailed Godwits were a little fatter than the Black-tailed Godwits because they leave for the Northern Hemisphere about a week earlier in April than them. The breeding plumage of the Bar-tailed Godwits as well as the Black-tailed Godwits is beginning to show. In this photo you can see the russet colours in some of the birds. There are also a few Pacific Golden Plovers in this photo. 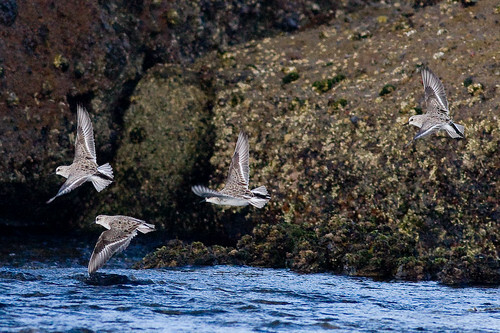 You can also see some of the Pacific Golden PLovers in this photo are starting to get their breeding plumage. 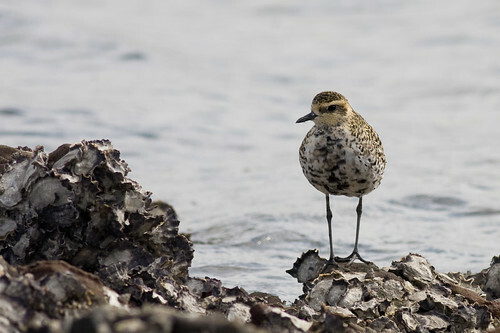 The Pacific Golden Plovers get a black front with a white edge around it. 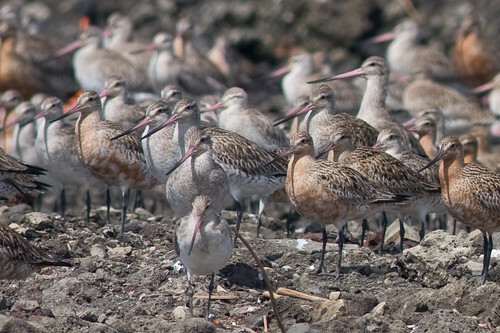 Note that the Bar-tailed Godwit has a slightly upturned bill, whereas the Black-tailed Godwit has a straight bill which can be a little pinker. 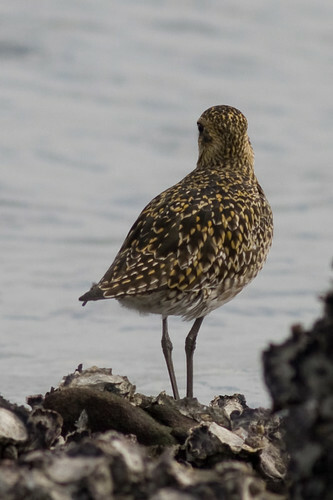 There were a few Pacific Golden Plover a little further west by themselves. Note that in one bird on the left, the white stripe that goes around the eye and down the chest is starting to form.